Sprint today announced a new $22/month upgrade option for iPhone users allowing them to pick up a new iPhone at anytime through a plan dubbed “iPhone Forever”. Sprint’s new plan seems to be reaction to recently introduced and improved offerings from T-Mobile and others, while Sprint previously had an “iPhone for Life” plan that offered yearly upgrades bundled with service plans. Sprint is positioning the new upgrade plan as competition for similar upgrade and leasing programs available through T-Mobile, AT&T, and Verizon. The company compared its iPhone Forever program with a $60 Unlimited plan to comparable plans with yearly upgrade options from the other guys. 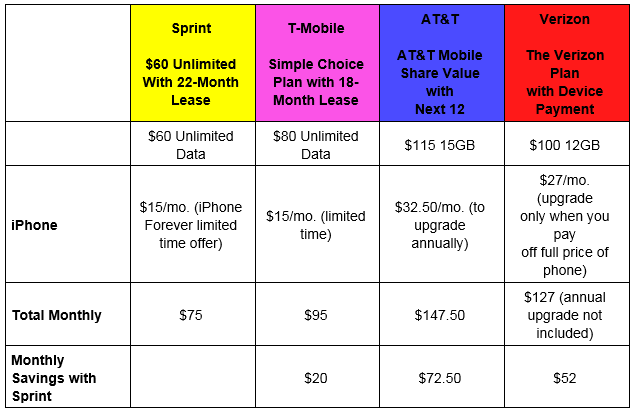 Sprint’s chart above uses a special $15 promotional price for its new iPhone Forever upgrade plan, but that price is only for those that trade-in an old smartphone for a new 16GB iPhone 6 to start off. Those users will pay $15/month for the iPhone Forever perk until their next upgrade, while everyone else will get the standard $22/month price. More info on signing up for the new plan on Sprint’s website here.